Amma’s words describing our ancient societies define the roots of what is termed as ecological sustainability and social self-reliance in modern times. Although this way of living in harmony with the ecosystem has been gradually disappearing in the majority of rural villages throughout the world, there are still some secret sources of such living wisdom. Likewise, many hidden hands are joining together to reawaken the unity amongst humans and nature. Gudipadi Cheruvu is our Amrita SeRVe village in Andhra Pradesh. 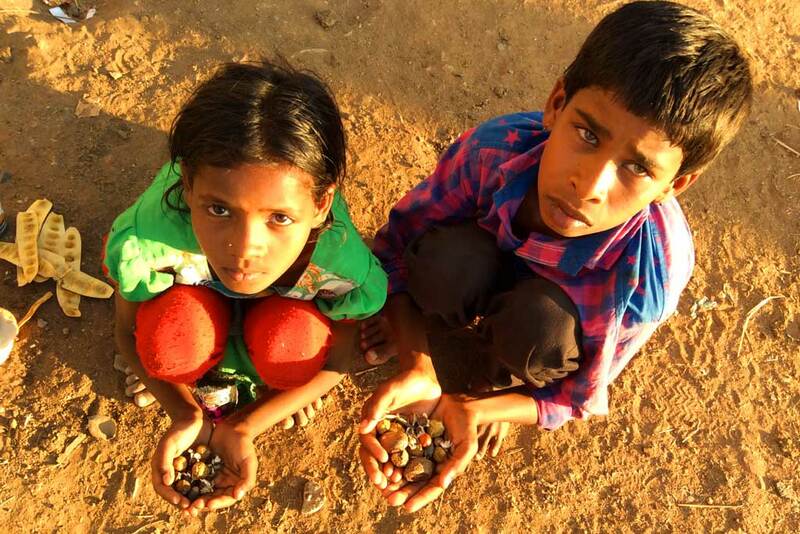 In their February visit, Sevites from Amrita SeRVe—Pranada and Chidanand—discovered little humble hands, ever ready to caress the earth and offer some seeds for the well-being of the planet and their joyful community. A hundred years ago, the entire region was covered by a dense rich forest. Now this native ecosystem has receded from the surroundings and remains only 100 km to the west as a protected area called Nallamalla Forest. The past seven decades transformed the tribal culture from livelihoods of family-managed gardens and fruit collecting to government-managed modern farming with cash crops of chili, cotton, and rice. These endeavors are dependent on the chemical industry and market rates. As a result, the everyday meals no longer grow in the backyard and food supplies are bought in the town a one-hour distance away. Labor is offered on a base of daily wages, commonly under governmental schemes. Water sources are becoming scarce, so those who can afford it are digging ever deeper bore wells. But now, these are also drying and the rains are failing. The region that was once a forest has been painted by the colours of a desert. Yet the innocent spirit of the tribal people, the brilliance of their smiles, and the depth of their eyes enlivens the village with an ever present beauty. Over the past years, Amma has been increasingly advising Her children to plant trees and preserve forests. The community of Gudipadi Cheruvu showed themselves ready to welcome such activities. Carrying a handful of seeds blessed by Amma, Amrita SeRVe sevites visited the village in February to initiate a small tree nursery. 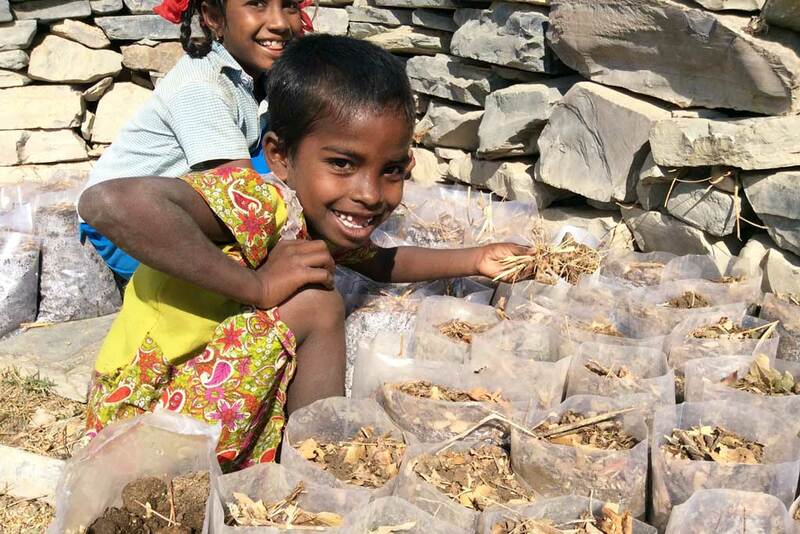 Every day as the sun lowered its rays towards the west, the children of Gudipadi Cheruvu would spontaneously join in the journey of collecting soil under the great grandmother tamarind tree by the lakeside. Dry cow dung would complement the big pile. The ever increasing enthusiasm of the small ones would fill dozens of bags. 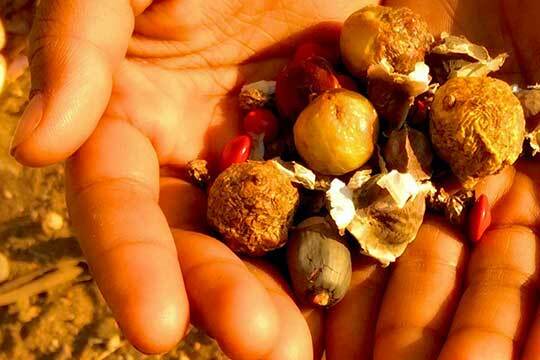 Ber, amalaki, papaya, musambi, red coral wood, moringa, tamarind, rain tree, rudraksha, frankincense, sandalwood, jackfruit, pomegranate, ashok, and many other seeds found their new home. Each species was carefully gathered to establish all the functions of a self sustainable forest—for regenerating the soil; for attracting rain; for recharging groundwater; for nourishing wildlife; for reducing global heat; for fixing nitrogen; for generating income; for increasing diet nutrition; for producing fruits for the young and future generations; for growing timber, fodder and firewood; and especially, for restoring the well-being of man and nature. The 500 seeded bags, produced by the faithful service of the tuition center children and staff, were distributed amongst the village families. In this way, the entire community is coming together to take special care of these saplings, which will be planted in the first rains of the monsoon. Nourished by the villagers and the natural cycles, new trees that will grow in community areas, lakesides, and house surroundings will soon invite the native forest to return to Gudipadi Cheruvu. 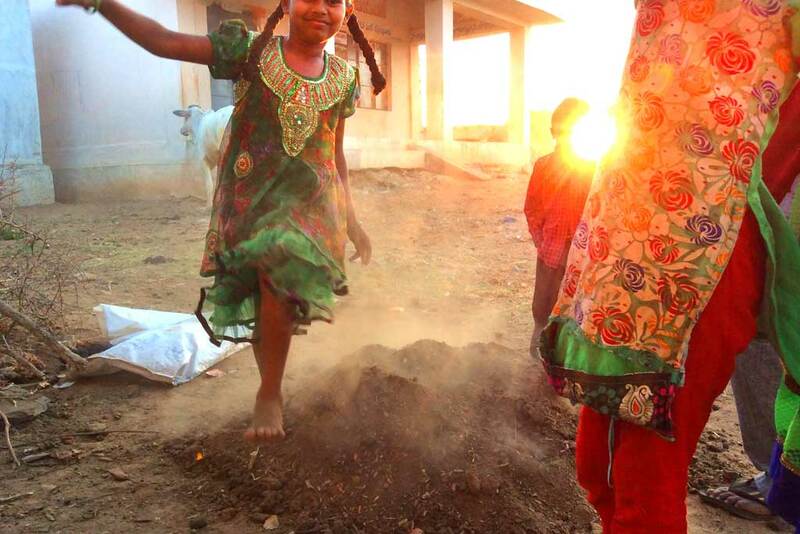 “Come dwell in our home,” resonates the silent chanting of the rural children. As for the blessed Amrita SeRVe children, the warmth of traditional India is germinating deep in the heart.